Listen to . . . When I was ready to start directing Comboland music videos (1980), the one band I decided to focus on was Arrogance. They were THE band in Raleigh and had a great Pop sensibility. But they were signed to a major record label and out of my league, as well as touring the US. But I kept watching them and tried to figure a way to work with them. Instead I had to prove myself with videos for other artists. By the end of 1981 I had become friends with Arrogance and was trying to figure a way to shoot some sort of video on the band. Arrogance formed at the height of the Hippie era (1969) in the dorms of UNC at Chapel Hill. By 1975 they had released two albums (Give Us A Break and Prolepsis) and had caught the attention of the major labels, which brought about the album Rumors for Vanguard Records. Their fourth album Suddenly came out in 1980 on another major label, Curb/Warner Bros. as well as adding Rod Abernethy to the line-up. This album was being played to death on WQDR, to the point where I thought their song TAXI was a national hit. It wasn't but it should have been! By the end of 1981 I had directed videos for The Fabulous Knobs and a Robert Kirkland protégé band, Luky Owens & Revolver. I had now become a member of the Comboland 'in crowd' as well as getting the attention of Arrogance. Unfortunately by this time, they had left their label and next released a Live album on local record label, Moonlight Records. Entitled Lively, this album meant there was no possibility for me to produce a video. 1981 and 1982 found singles released from the band and that is where I finally discovered my opportunity. December 1982 Tony Madejczyk and I were able to schedule Arrogance on the WPTF-TV kids show, Barney's Army. By the following autumn I started production on the B-side of their single, for the song WHERE ARE YOU BABY?. Sadly, it took a while to finish the video due to the small budget and lack of beggable post production favors on my part. By the time the video was finished, so was Arrogance. SOUTHSIDE GIRL and WHERE ARE YOU BABY? were to be released on their next album, which never happened. The tracks for this final album became scattered throughout solo efforts. It would later come out ten years later on CD as the album 5'11". 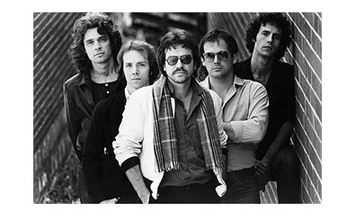 As much as the band had broken up, Don Dixon had worked his way into becoming a top-notch record Producer. He and Mitch Easter's teamwork in promoting their love of Jangle-Pop changed the sound of the Pop charts nationally and internationally. Don and Mitch would produce R.E.M., as well as Don handling production for artists such as Richard Barone, Kim Carnes, the Connells, Marshall Crenshaw, Guadalcanal Diary, Hootie & the Blowfish, In Tua Nua, Marti Jones, Tommy Keene, Let's Active, James McMurtry, the Reivers, the Smithereens, Chris Stamey, and Matthew Sweet, among many, many others. Don has also released a long list of great solo albums. I remember an excited phone call from Tony Madejczyk in 1985, "Dixon's PRAYING MANTIS is a hit in Sweden!" I wound up spending some time with Don again in 2004 while he was with The Hanging Chad (story below). Meanwhile, Rod has taken over the old Audiofonics studios were he has been creating some wonderful soundtracks for Hollywood movies, network and cable television programs and has really made a mark in soundtracks for video games, in particular, the Star Trek series. Arrogance still keep in friendly contact with each other and will get together once a year. We can hope for a reunion summer 2008. I knew Arrogance was playing The Pier, but I had to work the 11 O'clock News at WPTF-TV. As soon as the news was over, I grabbed a camera from the news department and drove as fast as I could to The Pier. I set-up behind the stage, turned on the camera and Arrogance said goodnight. It was now well past midnight. I took advantage of the break before the encore and repositioned myself in a better place for photography, in front, stage left - a great place for shooting, but not to capture vocals. The stage speaker for vocals was focused on stage right. So here's a Rock history gem with misbalanced sound, but a great chance to witness Arrogance having fun in their prime, doing a few covers. By the way, the camera goes to black because some enthusiastic (drunk) fan pulled a cable on my camera. I was able to connect it quickly enough to shoot for the final bow. I'm amazed the sound continued to record! Of special note is Terry Anderson and Jack Cornell from The Fabulous Knobs joining in for GLORIA. The Knobs were a surprise guest for one song at the beginning of the Arrogance encore. The actual set runs like this: The Fabulous Knobs MAKE IT STICK / Arrogance LIVE At The Pier - PART 1 - BLUE SUEDE SHOES, MR. CUSTER / Arrogance LIVE At The Pier - PART 2 - LITTLE LATIN LUPE LU, GLORIA, PUFF THE MAGIC DRAGON. My contribution to SOUTHSIDE GIRL was as a fan who tried to make things right. I was also employed by WPTF-TV to handled engineering and tape for for their prime time programming, including the kids show, Barney's Army. The Barney show Director, directed the shots and edited the Arrogance performance. When he left, I took the raw footage (late at night, after Tom Snyder's Tomorrow Show) and corrected his mistimed and poorly synced edits. I also created an alternate version of the clip by taking out shots of Barney and a jumping toy kangaroo and replacing them with more shots of Arrogance, so that the clip played as a complete Arrogance performance music video. The Barney version of the clip aired on Barney's Army in December 1982. This version has only been seen at an Arrogance party in 1983. I originally wanted to Direct a concept video for SOUTHSIDE GIRL but for some reason the song did not go into production. Instead, WHERE ARE YOU BABY? which was the flip side of the single, was produced as a music video. As a 2-D Live "animation" puppet Barney was the ultimate in 1950's technology for the 1980's. Barney was brilliant. And what put Barney over the top was puppeteer and producer, Laurie Wolf. Normally Barney (Laurie) interviews kids, in this case the group of kids with ADD are Arrogance. The interview doesn't make a lot of sense, but that didn't matter. Arrogance was on the show, and the fans loved it! Special effects were a special effort back then. Wipes and keys were the only tools in the arsenal and so odd thoughts like shooting a television monitor with a close-up of lips and wiping that over Robert Kirkland's glasses was considered cool. It's certainly odd! And chroma keys were a bit jaggy. But it was high tech at the time. Storylines were big too. This video's storyline is a bit much and looks like it's a solo video from Robert rather than a song from a band. That was me trying too hard as a director and not Robert trying to take over the band - sorry guys. Still, it was a lot of fun and is fondly remembered by all. Sadly, after decades of being together, Arrogance broke up months after the completion of this video. A bonus track from Barney's Army. Tony Madejczyk and I were the usual suspects in this production. This song was originally released as a special 45 single. It has not been given a CD release. LITTLE DRUMMER BOY was the flip side on the single, which was released on the Arrogance SUDDENLY CD. A third and fourth song, WHITE CHRISTMAS and TWELVE DAYS OF CHRISTMAS were also on the EP and have also not been digitally released - and are also brilliant and funny. 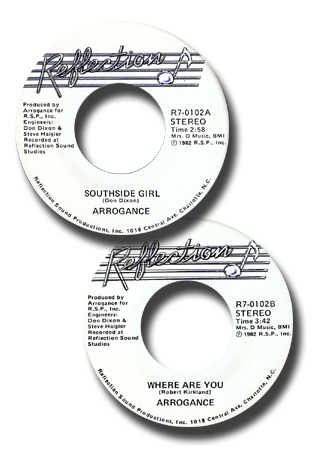 Above: Record labels from SOUTHSIDE GIRL and WHERE ARE YOU. 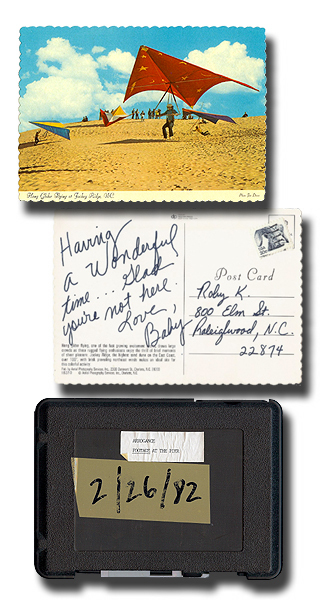 Below: Post Card from the video WHERE ARE YOU BABY?, and the original 3/4" camera videotape of Arrogance Live at The Pier 1982. 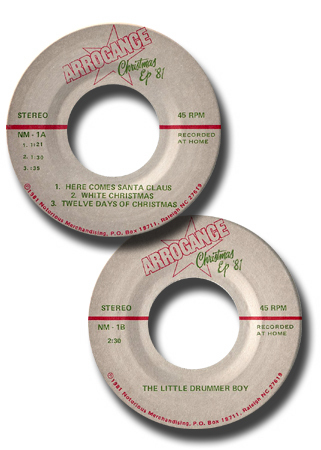 Above: Arrogance Christmas EP '81 record labels. 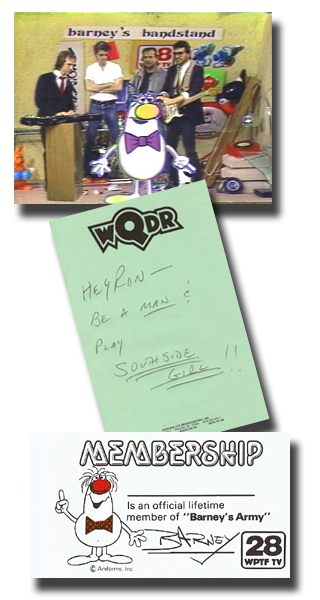 Below: Arrogance with Barney, my record request to WQDR's "Rockin'" Ron Philips, and a Barney's Army Membership Card. For those of you into Karma (Instant or otherwise), my first music video in Nashville (1987) was for Foster & Lloyd. Bill Lloyd was a fan of the RTC bands, knew their music and had seen a number of them perform so my RTC demo reel gave him confidence enough to hire me thereby starting me off on a seven-year run of directing major label music videos. One cold winters day (01.06.04) Bill called to say he was in a new band with Jamie Hoover (Spongetones), Don Dixon (Arrogance) and Robert Crenshaw (Marshall Crenshaw) and the band was rehearsing at his house and I should come by to say hello. I couldn't get there fast enough! It was great to catch-up with Don and Jamie and fun to watch these guys play, knowing I directed videos for three out of four members of the band. Sadly I didn't have access to a video camera at the time, but I was able to take some pictures. The Hanging Chads can be heard on the dB's tribute CD, STAND-INS FOR DECIBELS, Jamie and Bill have a great CD they did together called PAPARAZZI and Don and Jamie can heard on the Let's Active tribute EVERY WORD as well as be experienced Live as The Jump Rabbits. The photos to the right are of The Hanging Chads rehearsal at Bill Lloyd's house and later that night, a live performance at 12th & Porter, Nashville (01.06.04). Group photo: Jamie Hoover, Don Dixon, Robert Crenshaw, Bill Lloyd. Click on The Hanging Chads photos for a slide show! Home | About | Contact | ©2007-2012 SkidMedia Inc. | Previous |Next .